One of the most picturesque cities on the Golden Ring, Pereslavl-Zalessky offers visitors a number of historic buildings to explore. The ancient path northeast of Moscow toward the Volga River is dotted with historic cities that form the heart of the Golden Ring. Prominent among them is the town of Pereslavl-Zalessky, located some 90 miles from Moscow with a current population of 40,000. By official account, the town was founded in 1152 by Prince Yury Dolgoruky, who is also said to have founded Moscow in 1147. 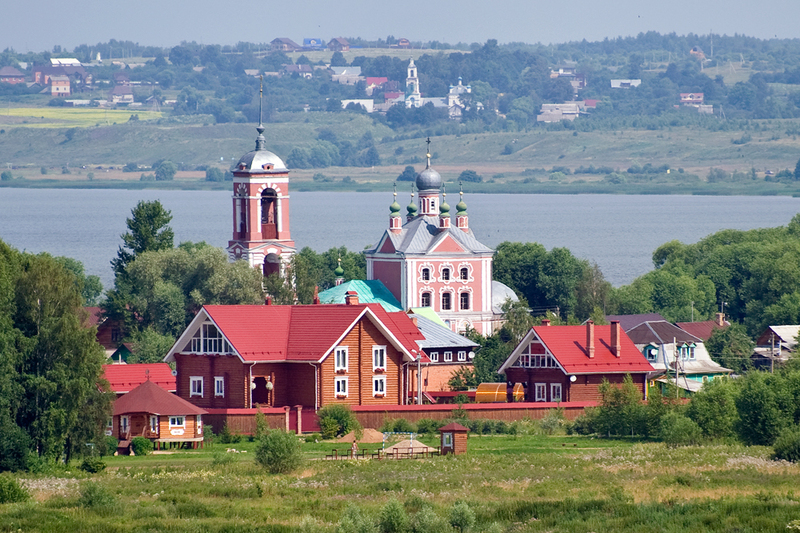 Settlers from Kiev, the capital of early Rus, had been moving to the area since the turn of the 12th century, and the town’s name is thought to derive from Pereyaslavl, a town near Kiev. The addition of “Zalessky” (“beyond the forests”) indicates that the new settlement lay within a fertile zone of fields and forest in central Russia. Among the several monasteries that remain in this ancient town, perhaps the most picturesque is the Goritsky Dormition Monastery, situated on a bluff overlooking the azure waters of Lake Pleshcheev. (“Goritsky” is related to a word for little hill.) Although relatively small, the lake played an outsized role in Russian history, including as a training ground for the young Peter the Great, who practiced sailing there. Because of the area’s turbulent history, there is virtually no information about the monastery’s origins, but it is known to have existed by the mid-14th century. One of Russia’s most revered monastics, St. Dmitry Prilutsky, was tonsured at the monastery, rose rapidly in the hierarchy and became acquainted with Sergius of Radonezh, avatar of Muscovite monasticism, during the latter’s visit to Pereslavl in 1354. St. Sergius became the deeply influential spiritual adviser to Grand Prince Dmitry Ivanovich of Moscow (1350-89), and the monk Dmitry assumed a similar role with the prince’s children. On the advice of Sergius, Dmitry left Pereslavl for the Vologda region, where in 1371 he founded the Savior Monastery, subsequently known as Savior-Prilutsky in his honor. How to get there: Buses for Pereslavl-Zalessky leave every hour from Moscow's Shchyolkovsky Station. The journey takes around 2.5-3 hours. Undoubtedly the most dramatic moment in the history of the Goritsky Monastery occurred in 1382, when the town was sacked by Khan Tokhtamysh as part of a devastating Tatar attack on Moscow. By grim irony, the Tokhtamysh invasion was a response to the first major Russian victory over the Tatars at the Battle of Kulikovo in 1380. Led by Prince Dmitry, the combined Russian army triumphed over the forces of Khan Mamai, who had just defeated Tokhtamysh during a prolonged struggle for power among the Tatars along the Volga River. The Russian triumph thus worked in Tokhtamysh’s favor. Needing to replenish his army after the titanic struggle, Dmitry—called “Donskoi” in honor of his victory near the Don River — temporarily left Moscow in 1382. Totkhtamysh took advantage of his absence to make a rapid attack with his mounted forces. After days of siege, they took the Kremlin garrison and inflicted such destruction on Muscovite territory that Dmitry was again compelled to submit to Tatar authority. Although one of Dmitry’s sons was taken hostage, his wife, Eudoxia (Evdokia; 1353-1407), escaped by virtue of a pilgrimage to the Goritsky Monastery in Pereslavl. At the time of Tokhtamysh’s attack in 1382, the Goritsky Monastery, like most of Pereslavl, consisted of log structures and could not offer serious resistance to the raiders. Nonetheless, Princess Eudoxia was able to descend to the lake shore with some of her retinue. As they floated on a raft toward the middle of the lake, a dense fog settled and hid them from view until the Tatar raiders left the ruined monastery. In memory of her rescue, Eudoxia provided support to rebuild the monastery around 1392. By that time, she had become the de facto ruler of Muscovy after the death of Dmitry in 1389 at the age of 38. Eudoxia is revered to this day for her wisdom and firm guidance during the early years of the reign of her son Vasily (1371-1425). Moscow’s ability to gather forces against Tamerlane in 1395 was in no small measure due to her authority. Although Moscow’s rulers continued to visit the Goritsky Monastery during the 16th century, it was overshadowed by building campaigns at the neighboring Trinity and Nikitsky Monasteries. In the early 17th century, Pereslavl, like much of central Russia, was ravaged during a dynastic interregnum known as the Time of Troubles. In 1608, a Polish-Lithuanian force devastated the citadel and much of the rest of the town. Over the course of the 17th century, the Goritsky and other Pereslavl monasteries were restored. The earliest surviving brick structures at the Goritsky Monastery include the Church of All Saints, rebuilt in the late 17th century on the site of a smaller 16th-century church. Dating from the same period are the monastery walls, with fancifully decorated gate structures at the southeast corner. The main Holy Gate supports the small church of St. Nicholas, completed at the end of the 17th century. A fire in 1722 swept through the monastery and destroyed its archive, but fate unexpectedly brought improved fortunes. A major ecclesiastical reorganization during the reign of Empress Elizabeth Petrovna led in 1744 to the creation of a wealthy Pereslavl eparchy, or diocese. Consequently, the Goritsky Monastery was transformed into the residence of the archbishop, an elevated status that brought resources for a rebuilding of churches on a grand scale. A leading initiator of the building campaign was Ambrose Zertis-Kamensky, who served as archbishop from 1753 to 1761. A well-educated and cultured cleric, he intended to create an ensemble that would reflect prevailing architectural values in such magnificent sites as the New Jerusalem Resurrection Monastery to the west of Moscow. The most imposing structure is the Cathedral of the Dormition of the Virgin, begun in the early 1750s and completed in 1761 to replace a church built in the 1520s. On the exterior, its design shows a mixture of Baroque and neoclassical elements in the manner of the prominent Moscow architect Karl Blank. On the interior, however, the cathedral displays a lavish decorative style in the late Baroque manner of Bartolomeo Rastrelli, author of the Winter Palace and other masterpieces in St. Petersburg. Another source is the work of Dmitry Ukhtomsky, a Baroque master active in the Moscow area. Of special note is the magnificent icon screen. The Dormition Cathedral is complemented to the east by a monumental four-tiered Baroque bell tower set in the east wall of the monastic compound. Its ground level contains the Church of the Epiphany. Construction was also begun on a large Gethsemane shrine extending to the west of the cathedral. During the reign of Catherine the Great, however, capricious fate brought a halt to plans for the ensemble. In 1788, the Pereslavl eparchy was subsumed in another ecclesiastical reorganization, and the extensive building projects were abandoned. The major bells in the tower were transported to the cathedral in St. Petersburg’s Peter-Paul Fortress, and local authorities scrambled to find a use for what had already been completed. Government offices occupied some of the buildings, and in 1788 the Dormition Cathedral was designated the primary cathedral of Pereslavl. Unfortunately, complaints increased about the site’s distance from the town center, as well as the steep climb on primitive roads. In 1838, the Dormition Cathedral ceased to serve as the Pereslavl cathedral. The various town offices were eventually vacated, and the uncompleted Gethsemane shrine was razed. In 1881 a grim red brick building was erected to the west of the Church of All Saints to house a religious school. What remained of the Baroque ensemble was increasingly despoiled, neglected and overgrown with weeds. In a final irony, the imposition of Soviet power stemmed the decline of the former Goritsky Monastery at a time when most monasteries were being ransacked. In 1919, the site was made available for use as a local history museum, a function that it fulfills to this day. And in the 1960s the distinguished preservationist Ivan Purishchev launched a preservation campaign that achieved extraordinary success with limited means. Although much remains to be done, the valiant museum not only offers an excellent display of traditional arts and crafts, but also preserves a significant architectural ensemble. Yet there is more for visitors: the north wall of the monastery has an observation point with a sweeping view of Lake Pleshcheev and one of Russia’s richest historic landscapes, dotted with cupolas, bell towers and monasteries.